. . . Just south of Aachen lay the Hurtgen Forest. Roughly fifty square miles, it sat along the German-Belgian border, within a triangle outlined by Aachen, Monschau, and Duren. It was densely wooded, with fir trees twenty to thirty meters tall. They blocked the sun, so the forest floor was dark, damp, devoid of underbrush. The firs interlocked their lower limbs at less than two meters, so everyone had to stoop, all the time. It was like a green cave, always dripping water, low-roofed and forbidding. The terrain is rugged, a series of ridges and deep gorges formed by the numerous streams and rivers. The Roer River ran along the eastern edge of the Hurtgen. Beyond it was the Rhine. 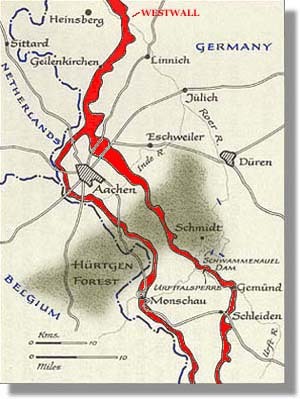 First Army wanted to close to the Rhine, which General Hodges decided required driving the Germans out of the forest. Neither he nor his staff noted the obvious point that the Germans controlled the dams upstream on the Roer. If the Americans ever got down into the river valley, the Germans could release the dammed-up water and flood the valley. The forest could have been bypassed to the south, with the dams as the objective. The forest without the dams was worthless; the dams without the forest were priceless. But the generals got it backward, and went for the forest. Thus did the Battle of Hurtgen get started on the basis of a plan that was grossly, even criminally stupid. It was fought under conditions as bad as American soldiers ever had to face, even including the Wilderness and the Meuse-Argonne. Sgt. George Morgan of the 4th Division described it: "The forest was a helluva eerie place to fight. You can't get protection. You can't see. You can't get fields of fire. Artillery slashes the trees like a scythe. Everything is tangled. You can scarcely walk. Everybody is cold and wet, and the mixture of cold rain and sleet keeps falling. They jump off again, and soon there is only a handful of the old men left." On September 19th, the 3rd Armored Division and the 9th Infantry Division began the attack. The lieutenants and captains quickly learned that control of formations larger than platoons was nearly impossible. Troops more than a few feet apart couldn't see each other. There were no clearings, only narrow firebreaks and trails. Maps were almost useless. When the Germans, secure in their bunkers, saw the GIs coming forward, they called down presighted artillery fire, using shells with fuses designed to explode on contact with the treetops. When men dove to the ground for cover, as they had been trained to do and as instinct dictated, they exposed themselves to a rain of hot metal and wood splinters. They learned that to survive a shelling in the Hurtgen, hug a tree. That way they exposed only their steel helmets. Tanks could barely move on the few roads, as they were too muddy, too heavily mined, too narrow. The tanks could not move at all off the roads. Airplanes couldn't fly. The artillery could shoot, but not very effectively, as FOs couldn't see ten meters to the front. The Americans could not use their assets -- air, artillery, mobility. They were committed to a fight of mud and mines, carried out by infantry skirmish lines plunging ever deeper into the forest, with machine guns and light mortars their only support.